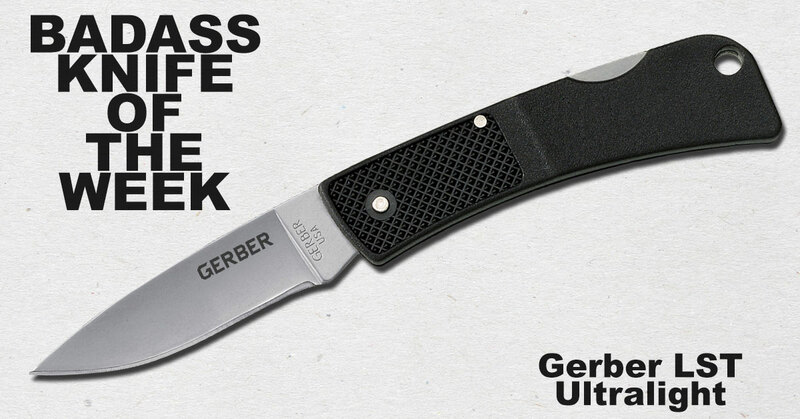 If you don’t think a simple lockback folder that weighs less than an ounce and doesn’t have a clip or thumbstud can’t be badass, the Gerber Ultralight LST would like to have a word with you. Our latest Badass Knife of the Week has years of history and craftsmanship by its side. The original was brought to the market way back in 1980 by Mr. Pete Gerber himself. He elicited the help of the legendary Blackie Collins to design a simple but effective knife that was lightweight and rugged. The result was one of the first knives to use all-synthetic materials in the handle, something countless knife companies do today. With an overall blade length of 1.96 inches and weight of .6 ounces, the knife is small and efficient. Its 420HC stainless steel and lockback mechanism make it reliable in all types of situations. The highlight at the time of its release was its glass-filled nylon handles, but its tactile textured handle continues to be a major selling point. A lanyard hole at the back allows for more security when holding the knife. If you’re not sold yet, the Gerber Ultralight LST is not only a steal but is entirely made in the United States of America. It doesn’t get much better than that. For more information on this Badass Knife of the Week, check out the product page for the Gerber Ultralight LST. I got mine 30+ years ago. The blade is 2″ long . from the plunge line. Steel is not identified on it.